In a quiet backyard dojo in Nunawading, Melbourne, a couple of Australia’s best known martial artists have come to assist their aikido instructor in his first photo shoot for Blitz. They, of course, are old hands. One of the men is kickboxing pioneer, former bouncer and bodyguard, founder of Zen Do Kai karate and all-round hardman, Kyoshi Bob Jones. The other is Kyoshi Billy Manné, a Zen Do Kai karate legend of similar experience and repute. The question is, why are they now here – as students? Helping him up, his aikido instructor Sensei Malcolm McRae laughs aloud, but Manné is only half joking. The six-foot-five freestyle karate instructor has seen his fair share of hard knocks in over four decades of martial arts training and security work. On this unseasonably cold November day — it’s snowing just a little further afield in Melbourne’s outer east – his body is not enjoying the punishment as it is sent crashing to the mat repeatedly, despite his ability to breakfall. So what is Manné — 7th Dan Black-belt and holding equal rank with his instructor, friend and head of Bob Jones Martial Arts (BJMA), Kyoshi Bob Jones — doing here? Why is he wearing a white belt around his gi (though McRae is happy for him to wear black), and offering his body up to be buckled, twisted and tossed to the mat? He, like Jones and several other of his lieutenants in BJMA, have “started again”, in Jones’ words. Though he and Manné are both in their sixties (neither will confirm their age), Jones explains that he had reached a point where he and his fellow seniors in the BJMA, the 7th Dans, knew there were still new territories to chart in their martial arts journey, but weren’t sure where. 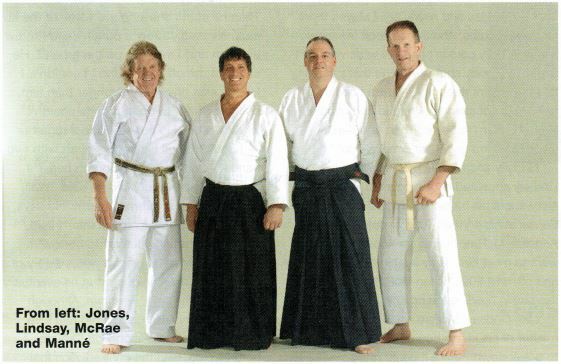 As ‘The Chief’ of BJMA, which encompasses Zen Do Kai, Jones found himself at a loss as to what advancements they could make to take them to an 8th Dan level and beyond. That was before he met McRae. So, here they are with McRae and his right-hand man Sensei Peter Lindsay, a former champion bodybuilder who began studying aikido some 20 years ago under film star and master Steven Seagal. Lindsay joined McRae in his Ki Fusion school only a year ago. When asked what he thinks other martial artists see in his method, McRae offers his own analogy: “It’s like driving a prestige car,” he muses. “People say, Oh, what a waste of money, why do you need a car like that?’ But they’ve never had the opportunity to drive one; they can’t appreciate the feeling. When you have, you understand. In aikido, I’ve driven that prestige car.” It’s a comparison that can certainly be appreciated by Manné, who voices concern for the duco of his Porche, parked in McRae’s driveway, as hail begins spattering through a gap in the dojo’s tin roof. In several years studying aikido with McRae, Manné and Jones have had a chance to do more than kick the tyres – they’ve felt the power behind the purr and know the thrill of superior handling. Of course, just as no-one wants to buy a car without a test drive, McRae understands that skeptics – and journalists – need solid proof that his aikido, which he describes as ‘ki fusion’, really works. And he doesn’t begrudge them that. 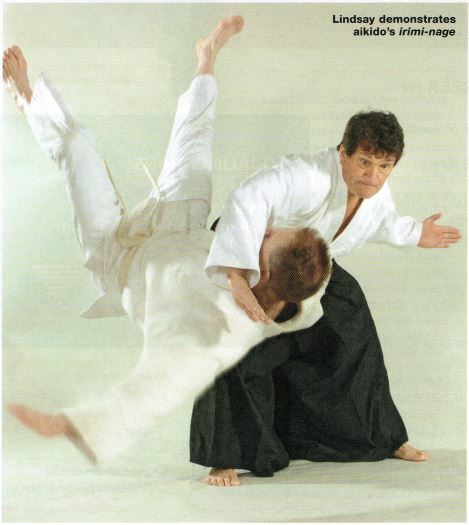 It was around eight years ago that Jones and company got their first demonstration of aikido, when the Victorian head of Zen Do Kai, Steve Nedelkos, organised for about 70 of their members to do a five-hour seminar with Sensei David Brown, McRae’s instructor. 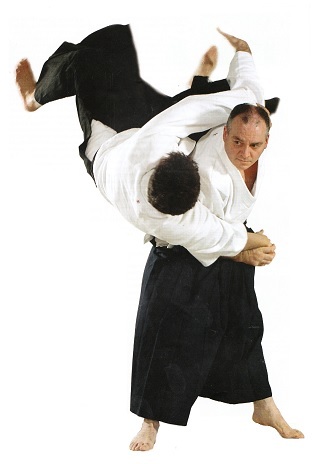 A quiet but much-respected senior instructor in the Aiki-Kai aikido organisation, Brown had introduced McRae to aikido after McRae became his apprentice as a watchmaker. Dutifully, McRae was there to play uke (receiver) to his sensei at the seminar. But as it turned out, he wasn’t needed. For now, McRae gives me the standard demonstration of his ability to fuse ki — “just so you don’t walk away thinking, ‘pah! This is crap … these guys are kidding themselves’,” he says, laughing. He asks me to grab his wrist as hard as I can, first with one hand, then with two, and try to stop him from breaking my grip. First he pulls and yanks, demonstrating what happens when he employs muscular strength: it’s two grimacing men in a tug- of -war (he, at over 90kg, is a lot bigger, however, and with the lesser grimace). Then he reverts to using what he calls ‘ki fusion’, and removes his wrist from my hands with such ease I can barely feel it happening. No speed, no yanking, no perceptible strength; I simply can’t hold onto him. Next, using a traditional aikido demonstration often called ‘the unbendable arm’, he places his wrist across our photographer Charlie’s shoulder and Charlie tries to bend his arm. Then we both try hanging off it, to no avail. Needless to say McRae has little trouble bending my arm. Or doing anything he likes with it, really. I try a bear-hug. Trying to pick him up off the ground is like trying to budge a bulldozer, though I’m not sure that even if I could do that, I’d be able to move this man any more – that is, more than not at all. Even after first allowing his chosen demo-dummy to assume his strongest stance and carefully apply his grip for maximum purchase, McRae expends no effort, and little visible movement, in putting me, Manné, or his right-hand man Lindsay – who at 92kg outweighs me considerably – on our backs. This is greatly preferable to experiencing his wrist – locks, however, which feel different to any I’ve felt before; softer, a burning sensation through the limb, and a sudden desire to go where he wants me too. I’d rather not escalate the demonstration to punch-defence, lest he find it necessary to raise the pain-delivery ratio in equal measure. Manné recalls a minor strike to his rib area that, while bearable at the time, left him barely able to move a few days later. “It’s amazing, it just takes away your spirit to fight… it makes you feel nauseated inside, and you don’t want to continue. I wish I’d found this years ago,” admits Manné. But what is it exactly that the Zen Do Kai men have found? What is it that McRae’s doing that they hadn’t discovered in over 40 years of training and applying their skills, some of which they’ve travelled the globe to learn? In essence, as I understand it, he is controlling my body by first taking charge of my preceding intention to push, pull or grab. “When they attack, their mind and their body – their intention of the attack and their physical body – is together. What I specialise in is, I remove their intention from their physical self at that moment. I lead their intention so that their physical isn’t attacking me along with their intention,“ McRae explains. These concepts might verge on the magical, especially to the Western mind, and are not easily understood, nor their application learned – especially as it’s unclear which of those achievements will, or should, come first. Indeed, McRae has been at it for some 25 years now, although he claims to have first felt this command of ki as a 1st Kyu (Brown-belt). From then on, he put all his focus into developing it further within himself. McRae can’t explain why it’s come to him more readily than to others – even his instructor Sensei Brown has not taken it to quite the same level, he says. Nevertheless, he attributes the awakening of his understanding to David Brown’s teaching. Lindsay learned the true power of ki in a similar way, though he took a somewhat different path in getting there. First, he travelled to Osaka, Japan, to become the first foreign uchi-deshi (live-in student) at the Suita dojo, home to his instructor’s teacher, the Grandmaster Seiseki Abe, 10th Dan, and his chief assistant Kinoshita Sensei. He explains that ki and its attendant concepts were not so much explained at the Suita dojo. Instead, an understanding of such ideas was sought through breathing techniques, coupled with the spiritual pursuits of Shinto prayer, called kotadama (‘sound-spirit’) and misogi, the rituals for purifying the spirit, which involved splash oneself with cold water, and other quiet pursuits such as calligraphy. As a body builder, Lindsay had spent years building an impenetrable wall of muscle; contracting, flexing, bulking up … not things normally associated with suppleness of body and spirit. Although the prayer and training had begun to quieten his mind, the real breakthrough in his understanding of aiki concepts and manipulation of ki came when he fell extremely ill and lost 20 kilograms of bodyweight in six weeks. The mystery illness enveloped him after injuring his back wielding a heavy boken (wooden sword). Lindsay and McRae met in 1994, after Lindsay appeared on the cover of Blitz with a story about his training under Steven Seagal Sensei at his (former) Tenshin dojo in Los Angeles. McRae, hungry for knowledge, went to meet him. They kept in contact, on and off, until 2006, when McRae asked to join him in building the organisation. Like Lindsay, McRae wasn’t always a master of his ki. He had a hard exterior to break down before it could really flow. Discovering – let alone mastering – something like ki fusion was far from his mind when he and an even burlier mate sauntered onto the tatami mats with Sensei David Brown for the first time. “Growing up I was a bit aggressive. I lost my father when I was 11, and that made me very angry. I couldn’t understand why he left me, if you know what I mean. I had met David Brown a couple of years after I lost my father and he became like a father figure … He sort of helped me to get on the straight and narrow,” says McRae. When he became Brown’s apprentice, McRae never knew his boss taught aikido – he didn’t even know what it was. But he remembers clearly when he first saw Brown take a class, at Kyoshi Tino Cebrano’s Goju karate dojo in Balwyn back in 1977. Already a senior rank in Australian Aiki-Kai, Brown invited his young charge along after McRae’s curiosity was aroused by his collection of aikido books. Though what he craved was mastery of such powerful technique, what he eventually discovered, he says, was love. Although like Manné, he also discovered that love hurts. It was a realisation won through hard training, with the contradiction that all the time he was learning to be soft, in both his technique and his approach to people. However, he’s quick to point out that softness in aikido is not as we know it. “Everyone has this ability of being able to be relaxed and being able to not clash with the other person’s strength, but it’s not softness in the normal sense, it’s softness with an enormous amount of power behind it. That said, McRae is quick to say that hitting anyone is low on the list of aikido’s aims, softly or otherwise. Applying the principles of aikido is about much more than technique – which is where the love concept comes in. McRae even demonstrates to me a technique he uses, which he describes as “diminishing [his] skeleton”. It certainly helps explain why I was a little confused when he met me at his front gate, not looking as much like the large, burly man I’d seen in photos. So this is the stuff of warrior arts – love, compassion and selectively diminutive stature? Lindsay believes so, despite having an irimi-nage (neck-throw) powerful enough that it “could knock your head clean off!” as McRae puts it. But, when you’re driving a prestige car, a farther destination just makes for a more enjoyable journey. Blitz (2007).